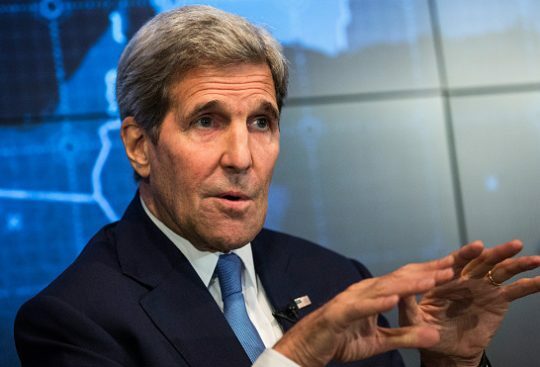 President Donald Trump castigated former Secretary of State John Kerry for engaging in covert talks with foreign leaders in an effort to salvage the Iran nuclear deal. Trump took to Twitter Monday to rebuke Kerry for initiating unsanctioned and "possibly illegal" talks with Iranian Foreign Minister Javad Zarif, as well as with the French and German heads of state in a concerted effort to keep the agreement aimed at curbing Iran's nuclear weapons program intact. Adding insult to injury, the president stated that if Kerry hadn't played a central role in "creating" the flawed accord "in the first place" there wouldn't be any need for his administration to debate scrapping it. "The United States does not need John Kerry’s possibly illegal Shadow Diplomacy on the very badly negotiated Iran Deal," Trump tweeted. "He was the one that created this MESS in the first place!" Kerry has faced mounting criticism for his reported efforts to save the Iran deal since the story was first reported by the Boston Globe last week. The deal was brokered under the Obama administration while Kerry served as secretary of state. On Saturday, Harvard Law School professor emeritus Alan Dershowitz and Sen. Marco Rubio (R., Fla.) both claimed Kerry's conduct brought up serious questions about it violating the Logan Act, a federal law that prohibits unauthorized individuals from negotiating with foreign governments that have a dispute with the United States. Former New York Mayor Rudy Guiliani (R.), who recently joined the president's outside legal team, echoed that sentiment Sunday, saying "nobody seems to care" Kerry "is violating the Logan Act." A spokesman for Kerry responded to the president's tweet with a statement defending the former secretary of state's actions. "I think every American would want every voice possible urging Iran to remain in compliance with the nuclear agreement that prevented a war," the statement read. "Secretary Kerry stays in touch with his former counterparts around the world just like every previous Secretary of State. Like America's closest allies, he believes it is important that the nuclear agreement, which took the world years to negotiate, remain effective as countries focus on stability in the region." Trump's tweet came on the heels of additional criticism the president leveled at Kerry during a speech at the annual meeting of the National Rifle Association (NRA) in Dallas on Friday. While discussing the Iran nuclear deal, Trump lambasted Kerry's bargaining style while making light of the fact the former secretary broke his leg in midst of the negotiations. "John Kerry is not the best negotiator we've ever seen. He never walked away from the table except to be in that bicycle race where he fell and broke his leg," Trump said. "That was the only time. I said, ‘Don't tell him you broke your leg. Just stay inside. Say you don't want to negotiate. You'll make a much better deal.'" "But he broke it, and I learned from that — at 73 years old, you never go into a bicycle race. You just don't do that. I'm not 73, he was, okay," the president added jokingly. Trump is expected to announce a decision on the Iran nuclear deal before a May 12 deadline. This entry was posted in National Security and tagged Donald Trump, Iran, Iran Nuclear Deal, John Kerry, Secretary of State, State Department, Trump Administration. Bookmark the permalink.